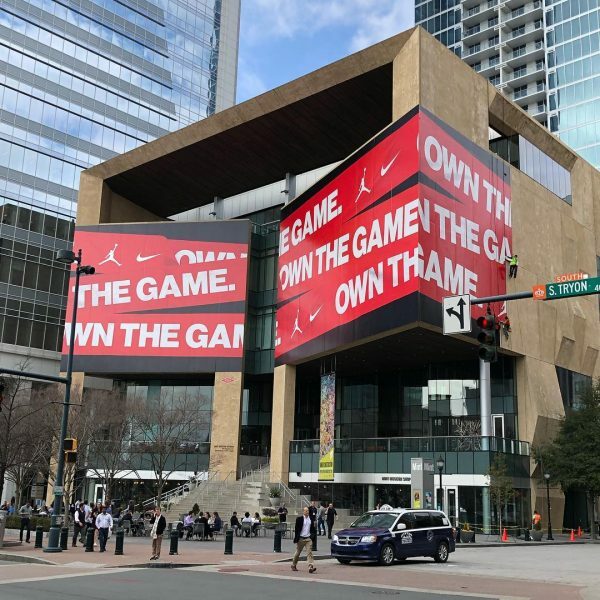 *IMPORTANT: For all calls and questions about the Nike Jordan “Owners HQ” NBA All-Star Weekend takeover at Mint Museum Uptown, please refer to the nike.com website. The Mint Museum does not manage tickets, passes, wait times, line information, or programming for Nike’s event. As a result, we are unable to take Nike related calls. For parking, please refer to our Mint Museum Uptown page for Levine Center for the Arts Parking Garage information. UPDATE: For the latest happenings, please visit the Nike Jordan Brand website. The Mint Museum has partnered with Nike and Jordan Brand to host special events during the NBA All-Star Weekend, which takes place February 14-17, 2019. Nike and Jordan Brand have rented all of the event spaces at Mint Museum Uptown for the month of February and will host events for team owners, the NBA Commissioner, and other special guests, as well as events open to the public. The Mint Museum Uptown galleries will be closed to the public from February 13-17 while NBA All-Star Weekend events occur. The Mint Museum Uptown Store will also be closed to the public from February 7-24 but will re-open as a Nike and Jordan Brand Pop-Up Shop from February 14-17. The Mint Museum is thrilled to engage basketball fans through this collaboration with Nike, Jordan Brand, and the NBA. The Mint Museum Uptown façade will display larger than life graphics, a basketball court will be installed in the Robert Haywood Morrison Atrium, and many other exciting and unique experiences will be available for basketball fans and museum lovers to experience. Mint Museum President and CEO Todd A. Herman, PhD believes that this partnership is a perfect opportunity for the Mint to connect with community members who may have never been to the museum. “Our goal at The Mint Museum is to engage the Charlotte community in any way that we can. We are excited to meet museum newcomers who will come through our doors during NBA All-Star Weekend, and hope that they will be compelled to return to the museum with friends and family to view our expansive galleries when they are open. Art, like sports, is for everyone, and we hope that our partnership with Nike and Jordan Brand will remind the Charlotte community that we are here to support them and our economy,” said Herman. Community members are invited to experience all of the Nike and Jordan Brand NBA All-Star Weekend events at Mint Museum Uptown and at the Mint Museum Uptown Store, as well as encouraged to visit Mint Museum Randolph to view the galleries and the African-Print Fashion Now! exhibition while the Mint Museum Uptown galleries are closed. Visit mintmuseum.org/events for more information. The Mint Museum is a leading, innovative museum of international art and design committed to engaging and inspiring all members of our global community. The Mint Museum is dedicated to leadership in collecting, exhibiting, conserving, researching, publishing, interpreting, and sharing art and design from around the world. These commitments are central to the museum’s core values of leadership, integrity, inclusiveness, knowledge, stewardship, and innovation, promoting understanding of and respect for diverse peoples and cultures.